Development of a hand- held device for monitoring blood based indicators for diabetes other than just Glucose like Glycated Haemoglobin percentage with respect to total Haemoglobin and its Product Launch. This technology and the product being developed on a portable platform are expected to be of relevance to urban health as well as rural health monitoring due to cost factors.7 Indian patents and 1 US Patent have been filed. A Start-up company “Path Shodh” has been incubated at SID, IISc Bangalore in September 2015. Microfluidic chip with channels on PDMS/PC/PMMA, to detect the flow of PS beads/cells through the channels are used for flow cytometry system for blood cell counting of atleast 20 L/min with integrated optical system consisting of Light Emitting Diode (LEDs) of nominal wavelength 633 nm and 488 nm with a power of 10-20 mW. Two prototypes have been developed using microfluidics technology, one on cell phone and another on the digital camera platform. Two prototypes for soil moisture sensor developed and tested – one with Temperature pulse probe and second with electrochemical potential principle. Also a cantilever based soil moisture sensor system has been developed which has a wireless connectivity. Further work is continued on the instrumentation aspects of wireless sensor nodes for agricultural systems. Explosive Vapour Sensor using poly (3-hexythiophene) and Cu-tetraphenyl-porphyrin composite based organic field effect transistor has been developed. This technology can detect vapours of explosives. A 4 element Metal oxide gas sensor array chip has been developed to sense CO2 gas in the range of 350 ppm to 1000 ppm. The sensor consumes extremely low power of about 50mW for 4 sensors, and is selective against gases such as SO2, CO and NOx. A low cost sensor platform for determining ionizing radiation using sensors based on organic semiconducting materials has been demonstrated. A web enabled efficient and intelligent remote health care system for cardiac diagnostics entitled ‘Silicon Locket’ has been developed. 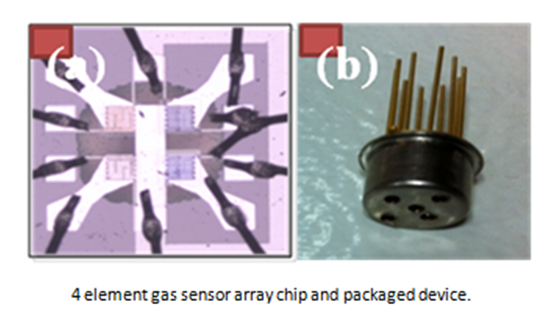 Design, fabrication and testing of a Nanocrystalline silicon MEMS pressure sensor in the range of 1mbar to1bar. A top down process has been developed to create transistors with nano needles on top of the gate oxide, to sense intracellular action potential. The process is capable of creating array of Nano needle Gated FETs (NGFETs). “Regioregular Conjugated Polymers Based on 3, 4-b-diheteropentalenes” Anil Kumar, Indian Patent. “Regioregular Conjugated Copolymers Based on Thieno[3,4-b]thiophene and process for preparation of same” Anil Kumar, Indian Patent. “Nickel (0) Catalyzed Kumada Chain Transfer Polycondensation” Anil Kumar, Indian Patent. “A Novel Process to get highly Conducting and Highly Transparent Thin Films and its Applications as Transparent Conductor” Anil Kumar, Smita Mukherjee, Indian Patent. “Novel Homogeneous Nickel (II) Catalyst” Anil Kumar, Indian Patent. “Automated Clinical Microscopy by Image‐based Flow Cytometer for Analyzing Substances and a Method Thereof” by Sai Siva Gorthi and Veerendra Kalyan Jagannadh. Indian Provisional Patent. “Double Quantum Well Enhancement Mode Nitride HEMT” Indian Patent. “An Improved Molecular Beam Epitaxy Multi Chamber Cluster Tool and Processes For Integration Of Multiple Growth Combination Of Group III-V Semiconductor Heterostructures”. Indian Patent. Novel Ways of Introducing High Voltage Handling Capabilities in FinFET Technologies – US patent. Over 1100 research papers have been published and many proof of concepts for various devices have been demonstrated under the programme.